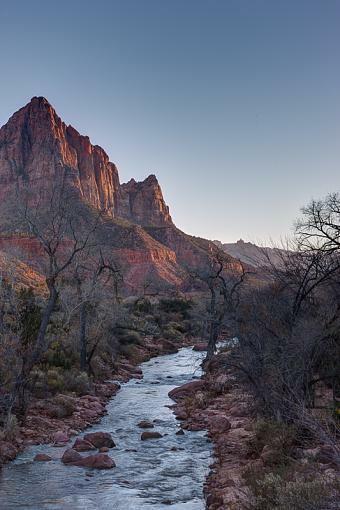 Zion Canyon from the bridge. I wish I'd been here about 2 weeks earlier. Classic scene. It never gets old. I can see why you would have liked to be there a few weeks earlier. It was a very good fall here in Utah this year, too. Still, I think this works well with the bare trees. And most of us can't entirely arrange out schedules around the weather and temperamental seasons. Sometimes we just have to take what we can get. And that's have the fun and challenge, isn't it? You've got great light here and your exposure is excellent. The only thing I'd change is crop it a bit tighter from the top. There's a bit too much empty blue sky for my taste and I think the composition gets a little stronger if you tighten it up.